“We prima facie feel that you (Anurag Thakur) are in contempt and we also prima facie feel that you are liable for perjury and we are inclined to launch prosecution. Once we pronounce the order, your client may have nowhere to go except to jail”: CJI Thakur told Anurag Thakur's lawyer Kapil Sibal. Supreme Court’s patience over sustained non-compliance of the Lodha panel reforms by BCCI ran out today with Chief Justice T S Thakur led bench warned to initiate contempt proceedings against its President Anurag Thakur for continued stonewalling of the reforms and open defiance of the apex court directions. On a day when it dismissed BCCI’s curative petition against order to implement the Lodha panel reforms, the court also said it planned to “proceed to prosecute him” (Anurag Thakur) for perjury for making false statements before the court on oath and warned that “once it pronounces its order, the BCCI chief will have nowhere to go except jail”. “This is frustrating. These were well meaning recommendations three judges of this court took pains involved all stake holders and you are trying to obstruct the reforms”, the bench headed by Chief Justice T S Thakur also said that it has almost made up its mind to remove the present office bearers of the Board and replace them with a panel of administrators. The judges have asked both Lodha panel and BCCI to suggest names of administrators and said it will soon pronounce an order on the action it will take against Anurag Thakur and the board’s top brass for continued defiance of its direction to implement the Lodha panel reforms aimed at sweeping changes in the function, structure and administration of the cash-rich board. The bench is furious that Anurag Thakur went to the extent of attempting to take ICC’s help to wriggle out of Lodha reforms. When there was ample proof of it on record, he had in an affidavit filed on oath denied the same before the court which the bench said amounted to perjury. 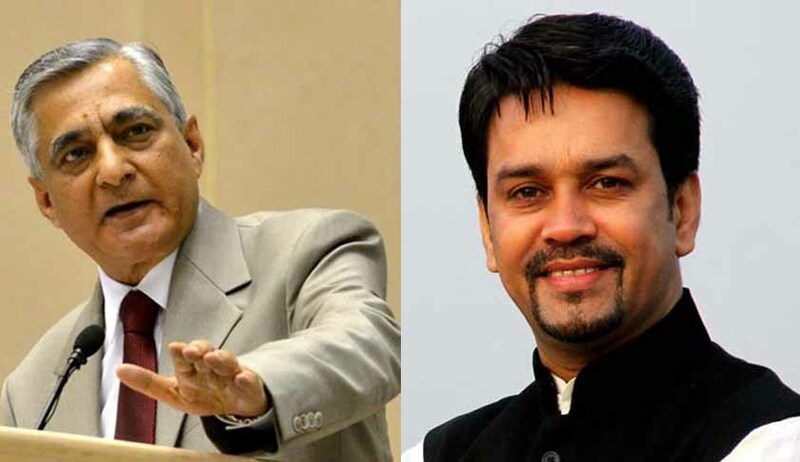 The bench found that Anurag had asked Shashank Manohar, the Chairman of the ICC to write a letter to the BCCI that the appointment of a CAG would tantamount to government interference in the working of the BCCI. It is to be noted that while objecting to the Lodha panel’s recommendation to include a CAG nominee within the BCCI to bring in "transparency and oversight in monitoring the finances", the Board had been consistently taking the ground that inclusion of a CAG nominee would bring in an element of government interference in board affairs, which under ICC rules was a ground for its de-recognition or suspension. Interestingly, Manohar in an affidavit admitted that Anurag had written a letter to him in this regard but he had refused saying that the Supreme Court had already taken a stand on appointment of CAG. During the hearing, Sibal said whatever the apex court was doing was for the betterment of the game but the bench should also allow the board to express themselves. “What the Supreme Court is saying is law and is binding but I may still disagree. That liberty I must have, he said. To this, the bench shot back, The issue is that whether you (BCCI) are absolutely incapable of implementing the recommendations of the Lodha panel which we have accepted. If a person is to be prosecuted for contempt or perjury, how can he continue? If a person is obstructing implementation of the order, how can he continue? Sibal, however, said, I can place the entire records before the court. I am willing to apologise if the court feel that I am misleading the court. No one can dare to do this with the Supreme Court. On the issue of appointment of observer in BCCI, he said it would not lead to any constructive steps. However, the bench asked Sibal, Do you want to give some names for the panel of observers. Initially, Sibal showed his reluctance but later he said he would take instructions and file a list of names. The bench then asked him to file the list within a week and said it would pass orders on whether to initiate contempt and perjury proceedings against Thakur. At the outset, senior advocate Gopal Subramaniam, who is assisting the court as amicus curiae, told the bench that affidavits filed by Thakur and BCCI Secretary Ajay Shirke clearly showed that the BCCI cannot implement the judgement of the court.